Note: Solidarity has also signed on to this statement from the Not1More campaign, and we encourage you to have your organizations do the same. Earlier this week, a number of organizations claiming to support immigration reform—including SEIU (Service Employees International Union), National Immigration Forum, United States Conference of Catholic Bishops, National Hispanic Christian Leadership Conference, Sojourners, and the Leadership Conference on Civil and Human Rights—signed a letter to President Obama asking him to delay executive action against deportations until at least the end of summer, arguing that Congress needs one last chance to pass reform. Within hours, the administration publicly agreed to delay action as “requested.” This is an outrageous and transparent attempt to undue the gains of the powerful movement against deportations. The Democratic Party strategy on immigration has always been to focus the debate on Congressional legislation and paint the Republicans as the real obstacle, thereby winning a political battle without taking any meaningful action. 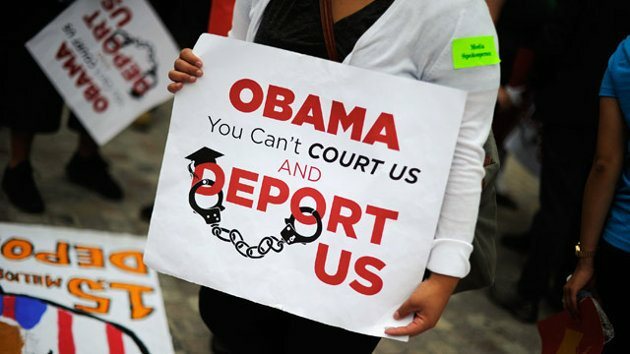 But we know and Obama knows that the President has always had the power to prevent deportations and end programs like Secure Communities without Congressional action, and the administration has already proven their ability to act under pressure by granting the Deferred Action for Childhood Arrivals (DACA) program and putting an end to new 287(g) agreements. Earlier this year, mounting pressure from the militant and growing anti-deportation movement forced President Obama to agree to a review of deportation practices and to promise changes by early summer. Even after the announcement, pressure has continued to grow with many Congressional Democrats publicly stating that the administration needs to take executive action to significantly change deportation policies. This recent development is clearly an attempt to reverse some of that pressure, buying time for the administration and putting the focus back on Congress and the Republicans. Not long after the story broke, an anonymous staffer for a DC immigration advocacy group told activists that their organization had been approached by a white house adviser and asked to sign this letter in order to give the administration cover. The President, who has deported a record two million people during his time in office, is making a desperate last attempt to avoid action and to shift blame back onto the Republicans just in time for the mid term elections. It is also an attempt to divide a movement. The militant youth who have built and led the contemporary movement against deportations have only recently been finding support from more mainstream and well-resourced organizations, including labor unions. A united movement poses a serious threat to the administration and to ruling class interests. This backhanded maneuver can be read as an attempt to drive a wedge between undocumented youth activists and the broader forces that might support them, thereby weakening a powerful movement and keeping much of that movement under the influence of the Democratic Party. It remains to be seen how well the strategy will work. There is certainly a fight back: organizers have loudly called out SEIU and the other groups who decided to sell out the 90,000 or more people who will be deported during the window granted to the administration. Some mainstream immigrant rights groups that have long supported reform have released statements denouncing the administration’s decision. Even the New York Times published a strongly worded statement from its editorial board that identified the real political dynamics and called the President’s bluff. At the same time, Reform Immigration for America, one of the largest and most influential immigration, NGOs has released a strongly worded statement pushing for a renewed fight for legislative reform: “starting today, this country will see activism around immigration reform on a massive scale,” their latest E-mail states. Other large and powerful groups are sure to follow. These groups will attempt to reorient grassroots forces toward reform, while saying nothing about the decision to delay administrative action. SEIU and other groups whose reputation in the movement matters little can take the heat for selling out tens of thousands of people, and RIFA and their like can complete the job. We must resist and fight back against this two-faced strategy. We need a united working class movement demanding an end to deportations, an end to programs like Secure Communities, and legalization for all. SEIU and their allies have willingly acted as the administration’s lapdogs in an attempt to divide this movement and grant cover to politicians who want to avoid action yet again. And so we call on everyone who believes in justice to see this move for what it is. We support the activists who are tirelessly fighting against the deportation regime and fight to ensure that nobody takes the bait by backing down from the demands for executive action and returning to yet another round of futile lobbying for reform. Solidarity’s Political Committee is a subset of our National Committee, the leadership body that is elected at our biannual National Convention. Y’all probably saw this, but if not, it’s copied below. Thanks for an excellent. dead ON essay. Carry on. Statement In Response To The Collaboration Of The Obama White House And Certain Organizations To Delay Administrative Relief To The Continuing Wave Of Super Deportations. We are not surprised by the Obama administration’s delay of administrative action past his promised July 4th date. We have grown accustomed to the President’s broken promises. The President’s malevolent pursuit of a super-deportation policy since his first broken promise, the failure to move immigration reform in his first 100 days, will continue unabated for the summer. Justice delayed is justice denied. The result will be another 100,000 families shattered by the destructive process of this unjust policy. There is no question that this is pure politics – as it has been for the last six years. The 12 million undocumented and their families continue to be treated as “disposables” in the war of elections and political ambitions of both parties. We remain committed to build the moral mountain on which the President must stand to extend “Daca para Todos” and “Parole for the Separated and Endangered”. We will continue to build Moral Mondays in front of ICE offices. And we will continue to gather the mustard seeds of faith among our people which will move that mountain to the White House. We are also not surprised by the Washington DC organizations which allowed themselves to be used to make excuse for this delay. We leave them to live with their own conscience. These are the very same comfortable DC Based organizations that provided cover for President Obama during the first 100 days of his first term as he broke his promise to move immigration reform in the first one hundred days of his administration. They reported promises from the White House every week that the President was “about to move” and in so doing disorganized the pressure that would have stopped the two million deportations that followed. These are the same organizations who have deflected criticism of the President’s Secure Communities Program and his super deportation program even as it reached the two million mark. Those two million deportations, those shattered families, those deaths on the desert, those murders in Mexico and Guatemala, are blood on their hands and last week they continued to wash their hands in that blood. We repeat that this delay has absolutely nothing to do with immigration policy or the lives of millions of undocumented people and their families. It is a continuation of a purely political agenda aimed at continuing the debate and the deportations in order to sustain the satanic paralysis of political ambition that has caused so much suffering to so many people. We will begin a movement now to register the Latino vote and to place voter pledges in a lockbox which will not be opened until the President issues executive action to extend DACA for all and Emergency Parole for those deported parents of U.S. citizen children and spouses now living the terror of the threat to their lives in Mexico and Central America. And we will continue our PROMISE WATCH on MORAL MONDAYS. We call on Latinos to suspend their membership in SEIU and we call on Christians to withdraw their participation in the Natinal Immigration Forum. We call on believers to suspend financial support for the congregations that stand behind this vile and inhuman policy – instead of putting your hard earned dollar bills in the plate, give them to a homeless person this week.